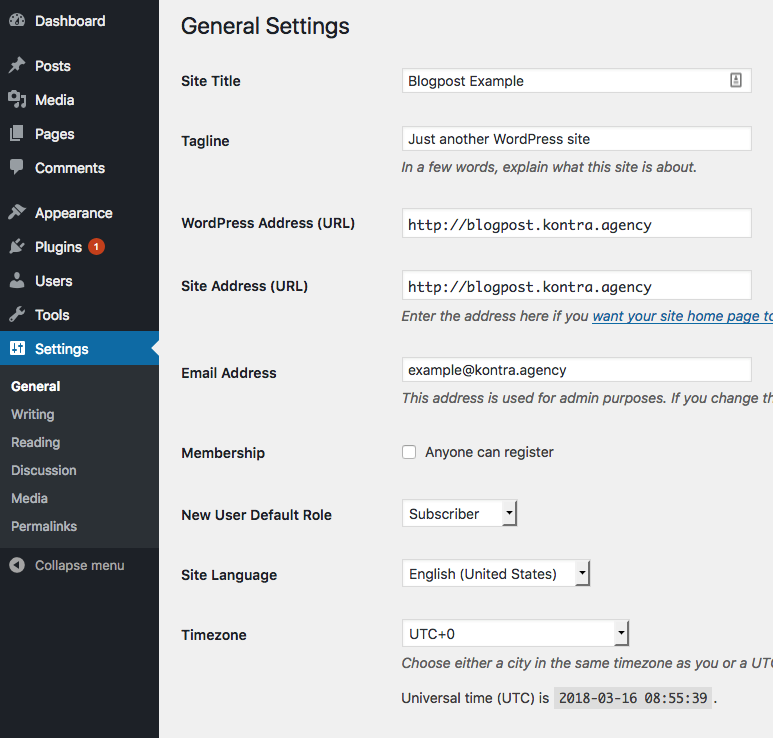 After successfully installing WordPress on a server in our last blog post, these are some settings you need to do to secure, speed up and optimize your site. It’s important to do these before you start publishing content. Nearly all WordPress installations come with the default WordPress site title, tagline and site URL. If you didn’t change these during installation or used some one-click installation from cPanel now is a good time to do it in General Settings menu. The first setting you will see is Site Title. The Site Title is displayed in the title bar of a web browser and is displayed in the header for most themes. It will be the first impression that customers get from your site. Think about it this way: your title is your brand. It’s how people recognize you among all the other sites out there. Keep your website’s purpose in mind. It’s fine to use something fun and crazy for a personal blog, but you should have something at least understandable (and a little professional) for a business website. Your site title is also important for search engine optimization (SEO), this is the title users will search on google so keep that in mind when thinking of a new title. A tagline is next and it is a short description or catchy phrase to describe what your webpage is about. You want to make sure your tagline sums up your site. So even though your tagline will be displayed after your title it just as, if not more, important since taglines provide context for your title, if it doesn’t already clearly indicate what you do. It also emphasizes or draws attention to the purpose of your site. A tagline also as a title will help your site show up in searches by containing keywords. You could have the coolest title in the world, but without a tagline, people aren’t going to know a purpose of your site. Setting up the preferred site address is a very crucial step since it will affect how visitors get to your site. You can either choose to use ‘www’ or without ‘www’, with “http” or “https” depending on which way you want your URLs to appear and type in the WordPress Address field. You really should use https because of new GDPR (General Data Protection Regulation). If you want your site homepage to have a different URL than the folder in which you installed WordPress, you should use the Site Address (URL) field to type the different homepage URL. Preferred language lets you set a language of your webpage. It’s important to set up your preferred language so search engines can bring you the right audience. You can make your site multilanguage with some plugins, in that case, you set up your sites main language here. And the last thing you should set up timezone, date and time format. This will be important for scheduling your content to get published in future dates. 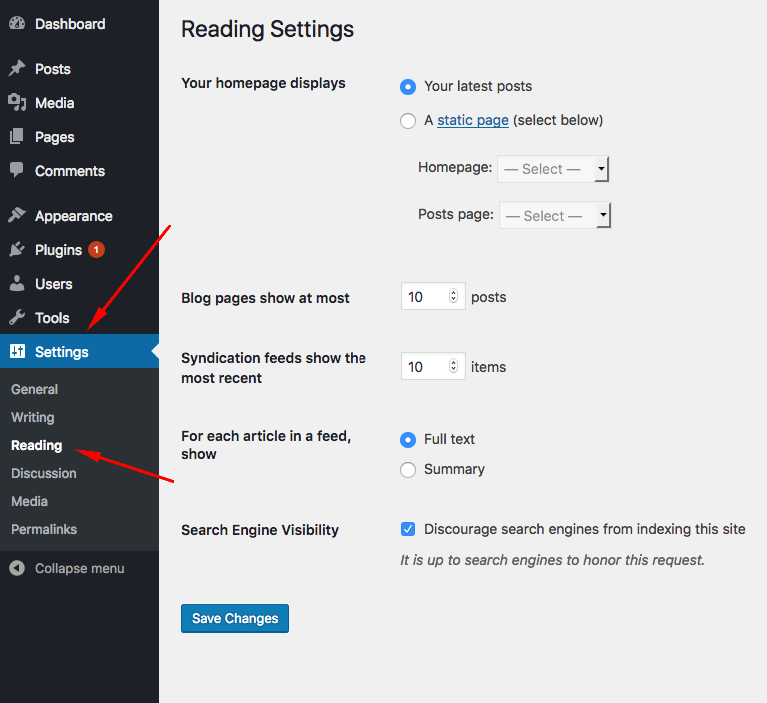 In most cases, you would like to see to set a custom page for a homepage in your reading setting. If you have created any page you can set it as a front page, also if you do that you would need a page for your posts. Posts page would need to be a page with a template for displaying posts. Also if your site is still in development and you don’t want it to show up on search engines, you can do that by checking Search Engine Visibility. Permalinks are the setting that controls how your website URL is displayed in your pages and posts. Setting permalinks must be done before you start publishing pages and posts. 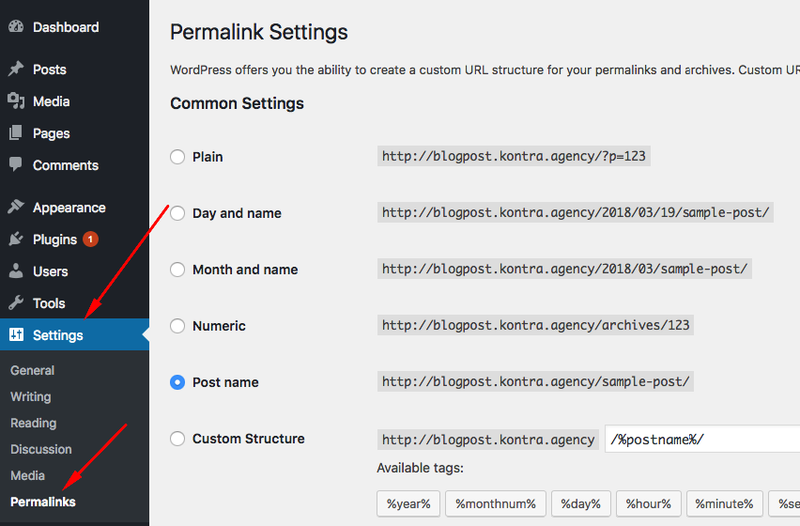 Permalinks affect your SEO, and therefore you should change the default permalink setting from Plain to a Post name or make a custom structure like/%category%/%postname%/ This will also add a category to your permalinks. These are just the basic Settings you should do immediately after the installation. Of course, there are many more options available, but we’ll cover those in some of future posts.